Chop tomato and parsley. Peel carrots and cut into sticks; core and slice apples. Add tomato, parsley, 1-2 teaspoon of fresh lemon juice (more or less to taste), 1 teaspoon of lemon zest, oil, salt, and pepper to the tuna; mix well. 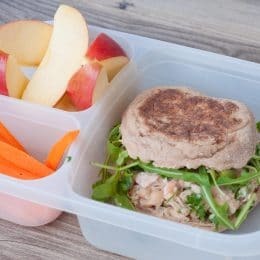 Toast muffins and scoop out tuna mixture onto each of 4 muffin halves. Add arugula and top with remaining muffin halves. Serve with carrot sticks and apples slices on the side.